I’d originally intended to respond to Joshua Schacter’s post about URL shorteners and how they’re merely the tip of the data iceberg, but since I missed that debate, Google has fortuitously plied me with an even better example by releasing custom profile URLs today. Facebook’s mission is to make it easier for people to share and connect. Owning the “people” namespace will determine whether people see the web through Google’s technicolor glasses or Facebook’s more nuanced and monochrome blue hues. Curiously, it has been (correctly) argued that Google “doesn’t get social”, a criticism that I generally support. And yet, with their move to more convenient profile URLs that point to profiles that aggregate content from across the web (beating Facebook to the punch), a bigger (albeit incomplete) picture begins to emerge. When I blogged that my name is not a URL, I wasn’t so much arguing against vanity or custom profile URLs but instead making the point that such things really should go away over time, from a usability perspective. Let me put it this way: at one point, if you weren’t in the Yellow Pages, you basically didn’t exist. Now imagine there being several competitors to the Yellow Pages — the Red, Green and Blue Pages — each maintaining overlapping but incomplete listings of people. You’re going to want to use the one that has the most complete, exhaustive and easy-to-use list of names, right? And, I bet beyond that, if one of them was able to make the people that you know and actually care about more accessible to you, you’d pick that one over all the others. And this is where owning — and getting people to “live in” — a namespace begins to reveal its significance. So, it’s telling thing to look at Google and Facebook’s respective approaches to their people search engines and indexes. 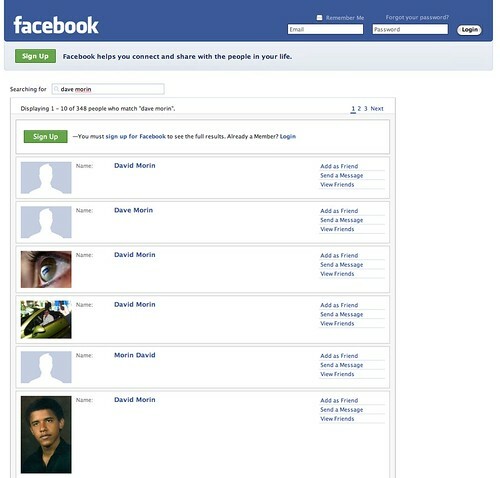 Indeed, having a readily accessible index of living persons — structured by their connections to one another — will become a necessary precondition to getting social search right (see Aardvark for a related approach, which connects to the Facebook and IM portions of your social graph to facilitate question answering). As social search and living through your social graph becomes “the norm” (i.e. with increasing reliance on social filtering), Google and Facebook’s ability to create compelling experiences on top of data about you and who you know will come to define and differentiate them. 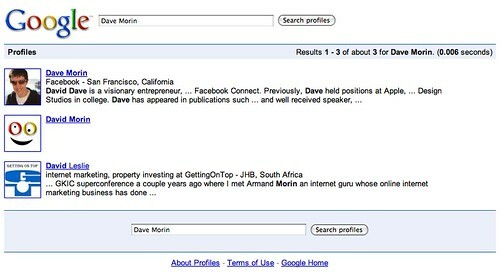 To date, Google’s profile search has been rather unloved and passed over, but with the new, more convenient profile URLs and the location of profile search at google.com/profiles, I suspect that Google is finally getting serious about social. Notice the difference? 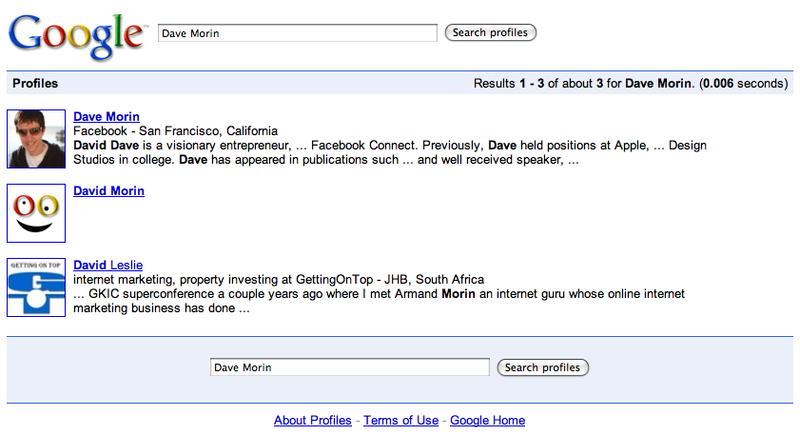 See how much better Facebook’s search is because it knows which “Dave Morin” is my friend? Google is able to provide a much richer and simpler profile, that’s much more accessible (without requiring any kind of sign in) because they’ve radically simplified their privacy model on this page (show what you want, and nothing more). Indeed, Google’s made it easier for people to be open — at least with static information — than Facebook! Clearly the battle for the future of the social web is heating up in subtle but significant ways, and Google’s move today shouldn’t be thought of anything less than the opening salvo in moving the battle back to its turf: search. What would be awesome, I think, is for the WikiMedia Foundation to launch a Directory project, a Universal PhoneBook of sorts. The reason I think WkiMedia should do it is because they already have the trust of people. What we really need is a Wikipedia that allows articles on anything or anyone, even if the topic is obscure. A real, global Library which includes anything and everything including people. Great post, nice comparison with Google / Facebook which added to the debate…. I was going to use Google Profile vanity URL, but then noticed in doing so, Google gives away my email address to the spam bots. What is up with that? I get a lot of spam in gmail as it is, don’t want more. Obviously I don’t want to be reliant on Facebook, or Google, but maintaining a server of my own is too expensive. Plus reading the ToS of services like Media Temple doesn’t give me any confidence that I have 100% ownership either. Type “Core IP Networks Dallas” to read the specifics. Ultimately having your own namespace is as fragile as letting Google do it for you? I have been talking about Google building a social network for awhile under all our our noses – but in a way that is much different and much more transparent to the user. They are surfacing data and features at times when you need it, but then it disappears when you dont. To me this is the power of a better network. But isn’t there multiple layers of namespaces? domain name for your name may not be available, it’s cheap but not free, its controlled by a handful of for profit companies, etc. In a way, it feels like we need to build something on top of domain names, not under. Something meta for idendity. Not necessarily DNS based at all. A Google Profile URL would be an excellent OpenID and great starting point linking to your data and services that you’d like to make portable (via OAuth). I’d like to be able to store public “about me” profile data in one central place (e. g. on my web site and/or attached to my OpenID). In that case, every service that wants to display my profile (or that I want to share my profile with) could just pull it from there (a nice XML format or something). It’s annoying to update/synchronize your profile pages at lots of different services. Agree with Tom, Google Profile would make a great OpenId to start! Also, I haven’t had enough time to check, that would be just awesome that the urls we enter there are “checked” so that we have a true identity in terms of “pages”. I agree I can’t be describe with one page (or one url), but I could certainly be described by a “network” of pages linked together (to “certify” they’re related)… Ideally, by just entering one of these urls anywhere, then, you could have access to all my online identities accross services! I think one of the assumptions that Facebook is making is that the majority of people searching will already be logged in. I very much like Google’s profile pages and would even trust them as an aggregator of my details from different social networks, and having one as a basic openid would be wonderful! BUT the email-address giveaway is a show-stopper for me. I should be able to generate a keyphrase or use a nickname! A URL identifier is great and should be public and easily found, but I shouldn’t have to expose personal information to have one. Good points, and as far as the near-term is concerned, I agree totally. But longer term I’d suggest that the advantage for a service provider with majority market share will generally diminish. Facebook and Google both display a fairly walled garden/data silo kind of mentality, but in the globally connected space The Rest of the World will always be bigger. With that in mind, services which make the borders between namespaces transparent/invisible are likely to gain more (new) market share over time through net natural selection. Re. having your own NS – yes, definitely (though whether this will ever become a practical option for *everyone* is another matter). See also Steve Pemberton’s take. i think you need to take into account an additional dimension: how famous are you? a) famous. make it like linus torvalds, let other people mirror your stuff. you don’t need to ask them as they’ll start doing it anyway. problem solved, the namespace gets less of a problem. b) not (yet) famous. you need to do your own mirroring. here, using an open p2p system might be the most persistent, most stable and most independent solution. as most people will start at b), using an open, standardized, company- and country-independent p2p network will likely be the key. I think Google is trying to be your personal storefront. 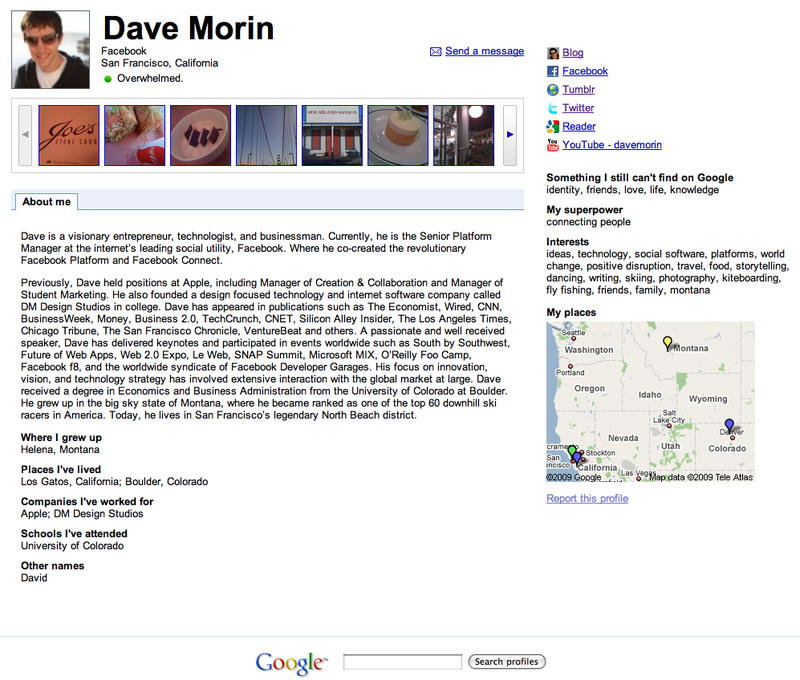 I wrote about that here, http://societrends.com/2009/04/16/google-profiles-may-become-your-storefront/. Interesting observations. Lots of food for thought. The problem I have is that your Google Profile name is your gmail address. They have an option for people to contact you without giving out your email address, but if you use the "humanized" url format, that is your gmail address. How are they going to handle bots scraping these profiles for gmail addresses? I would rather have my real name (which isn't my gmail address necessary) or another nickname as profile name, while the profile itself would still show my real name. Thanks for posting this. I'm a big fan of Google's profiles, and I'm certain that there's someone at Google who knows enough graph theory to add some smart guessing to a logged-in profile search. And re: Google "not getting social," I think they might "not get it like a fox." I'm impressed by their choice to use my chat list as a potential list of my "friends" when setting my profile's settings. It turns out I was building a useful shortlist of contacts when deciding who I want to IM with. Google Reader won my heart because of its social elements. I'm willing to put up with some major shortcomings from Google Docs because it's social software. I predict we'll start seeing our friends' profile pics popping up on SERPs before too long. Search for "restaurants in San Diego" and you might find a blog in the results accompanied by a note saying "your friend Jed subscribes to this blog in Google Reader." It’s too bad that Twitter didn’t think of reserving all the names that might one day be valuable to sell them off. Many of the Fortune 25 companies including Exxon, GE, GM, HP, and CVS aren’t able to use their corporate names as their own account. 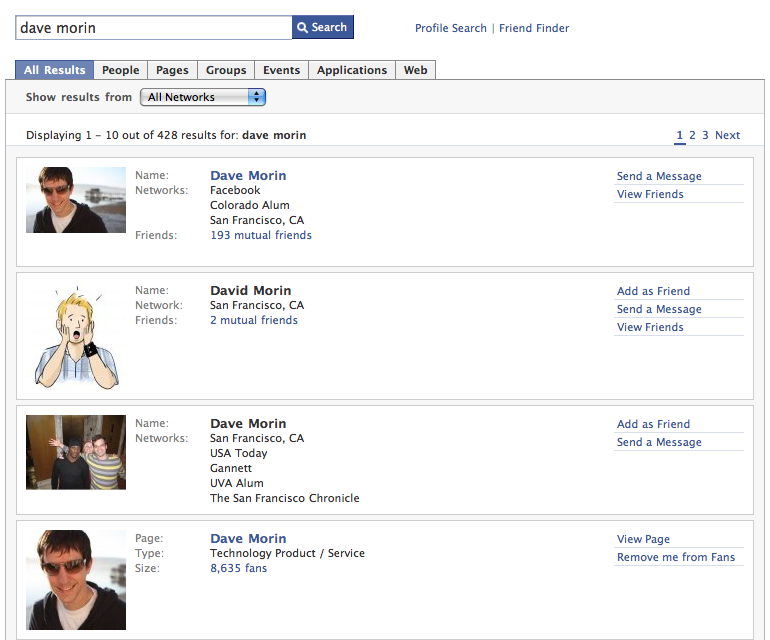 I’m interested to see how Facebook handles multiple people with a claim to the same name. Will it be an auction or first-dibs? I hope they do some sort of analysis for people with the same names to see who posts the most/best content on Facebook and gives it to that user.